Safe Routes to School (SRTS) is a comprehensive program based on a simple premise: our kids should be able to safely walk and bike to school. 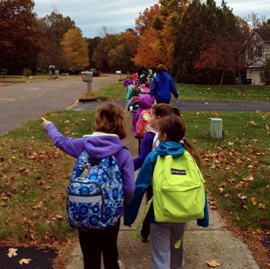 Walking and biking to school helps students develop independence, improves academic performance, helps reduce traffic congestion and air pollution, and helps create a stronger community. Vermont Safe Routes to School is part of the VTrans Bicycle and Pedestrian Program. Local Motion, Vermont’s statewide nonprofit walk-bike advocacy organization, assists with the non-infrastructure side of the program, answering questions and providing guidance to partner schools. Participating schools use the 5 E's (education, encouragement, engineering, enforcement, and evaluation strategies) to make it safer, easier, and more fun for students and their families to walk and bike to school. 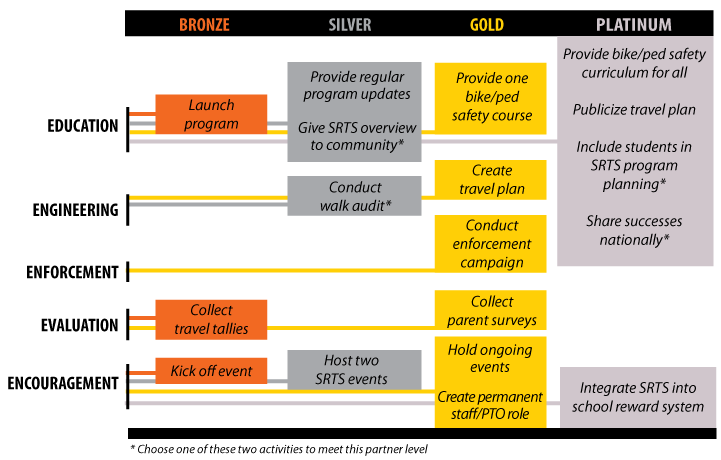 The Vermont Safe Routes to School Partner Program guides schools through these strategies and activities, earning Bronze, Silver, Gold, and Platinum Level status as they advance. Schools that progress through the Silver Level typically have established programs and see an increase in students walking and biking safely to school. The following diagram outlines activities to be completed at each level. Details can be found on the School Partner Program page.